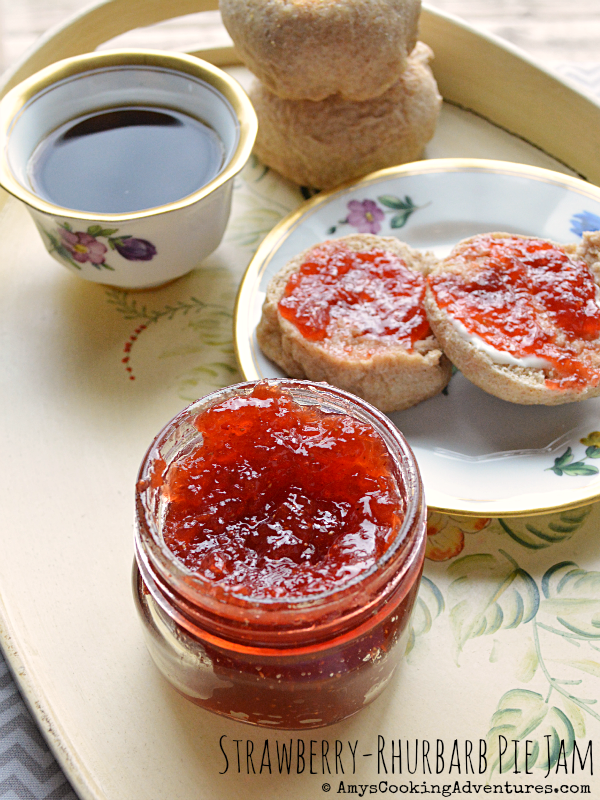 This week’s #HandCraftedEdibles is all about the jams and jellies! This one took a lot of research, because I don’t really eat jams or jellies (I grew up on peanut butter sandwiches, not PB&J). So, of course, I’d never actually made jam before. But I’m always up for a challenge! I decided to take my favorite pie and re-imagine it into jam! And know what? It was amazing!! I think I’m a jam convert! I absolutely adore the warm spiciness of this jam. I think it adds the extra pizzazz that I was always missing! Place the strawberries (thawed if using frozen) and rhubarb in the bowl of a food processor and process until crushed. Place the pureed berries into a large sauce pan. Stir in the lemon juice and pectin and bring to a rolling boil, stirring frequently. Add the sugar and spices and return to a boil. Boil for 1 minute, then remove from heat and skim off any foam. Pour the hot jam into clean mason jars. Top with the lid and flip the jars until the cool and the lids seal. Alternately, use a canner according to manufacturer instructions. In an effort to make all of her holiday gifts this year, Camilla at Culinary Adventures with Camilla invited some of her favorite foodie bloggers to share recipes for hand-crafted edibles. Over the course of twelve weeks, we'll be sharing recipes for all your homemade holiday gifts. Hope you'll follow along for inspiration. 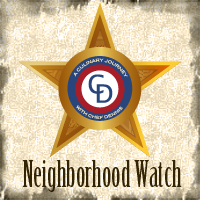 You can find out more information, including the schedule: here. 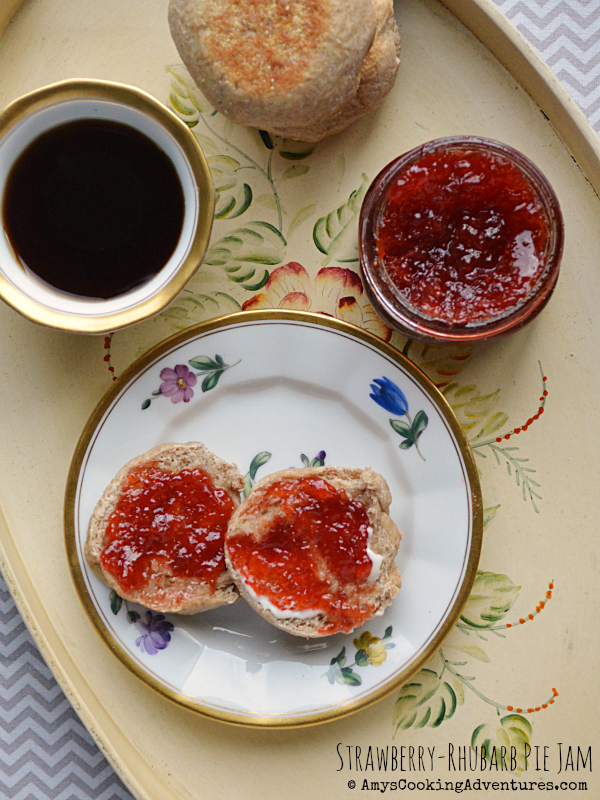 This week, we're sharing recipes for delicious jams and jellies. Next week, check back for our recipes for pickles. Or check out our #handcraftededibles pinterest board. This sounds lovely Amy. Great recipe. Putting it on my list for next summer. 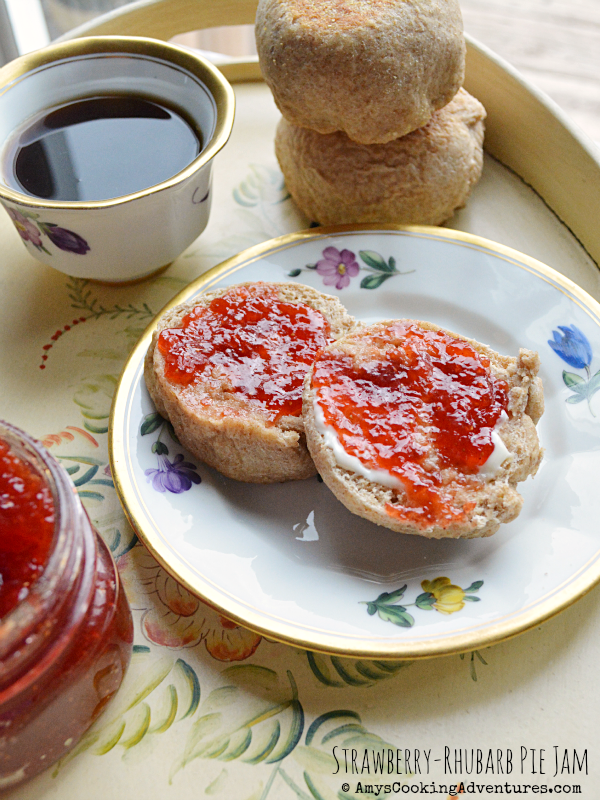 I LOVE that you had never made jam before and took the plunge with #HandCraftedEdibles. Thank you! I have some rhubarb in the freezer. I will have to try this. 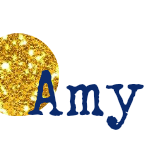 Thanks, Amy. I loooooove strawberry rhubarb jam - it's one of my FAVORITES!! What a great idea! My dad would LOVE this.